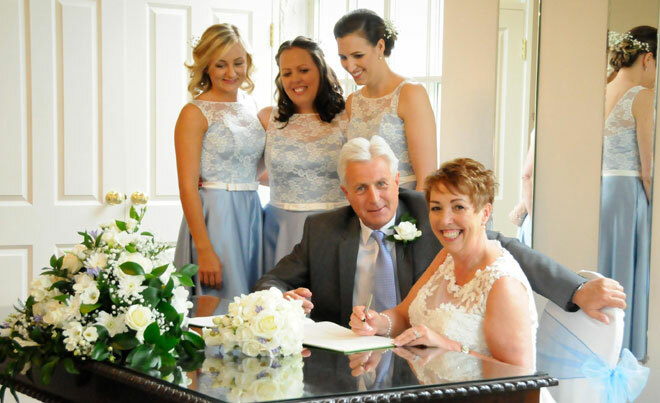 From my very first meeting right through to the wedding day, it was clear to me that the whole family team were going to be involved with Jill and Jem’s weddings. You’ll see from the beautiful photos that were kindly sent to me that everyone has a beaming smile and it looks like a celebration full of joy. The colour theme had been set by the time I met up with everyone to discuss the wedding flowers. 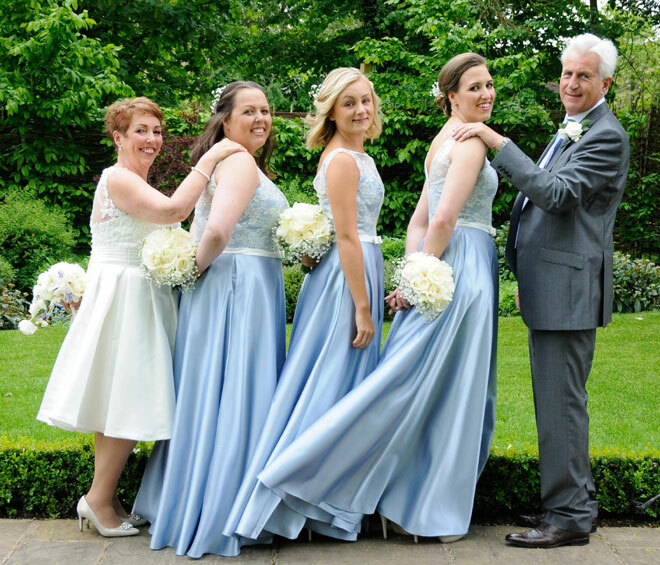 The stunning pale blue of the bridesmaids’ dresses was always going to be hard to match in terms of flower colour. Blue is probably one of the hardest colours to match with flowers, as the choice is really limited. 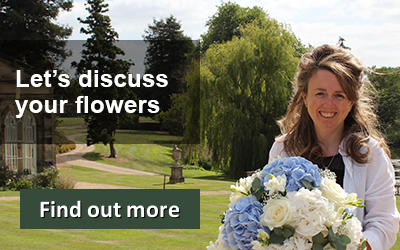 After seeing a bouquet in my portfolio it was decided that I’d use delicate blue ‘Triteleia’ in Jill’s bouquet. So I set about designing her a tight teardrop bouquet similar to one I’d previously designed. 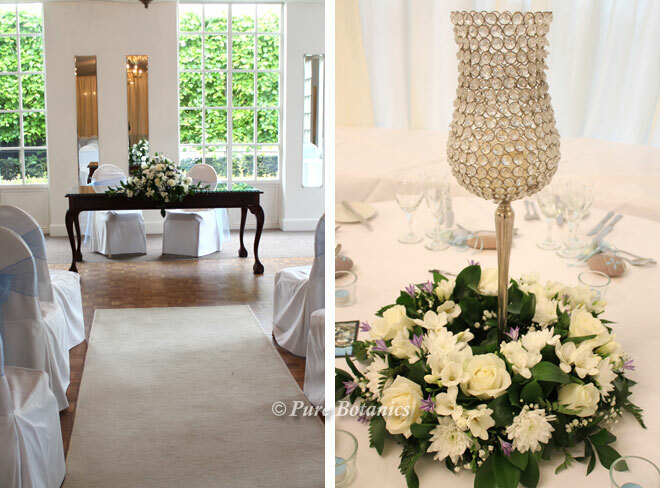 The main flowers are ivory roses, rosebuds, phalenopsis orchids, freesias and a very subtle hint of pale blue triteleia. The rose buds enabled me to fill in the gaps to create the lovely packed look to the bouquet that you can see above. The orchids enabled me to create a petite trailing point as it’s important not to create a long trailing shower bouquet for a wedding dress that’s knee length as it overshadows the stunning gown. I just loved Jill’s dress I think the style and length is fabulous. I think the photographer has done a fabulous job of capturing the fun and joy of this wedding day. The photo above has to be my favourite I just love the way everyone is in height order with Jem at the top. 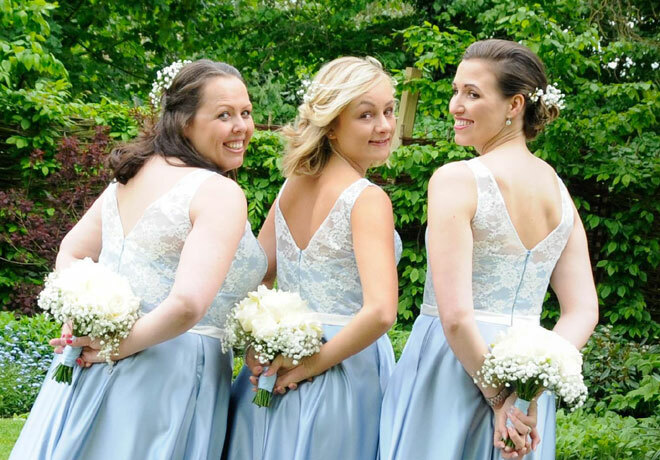 The three bridesmaids had their hearts set on gypsophila and decided that they would like a collar of delicate gypsophila to surround their bouquets. 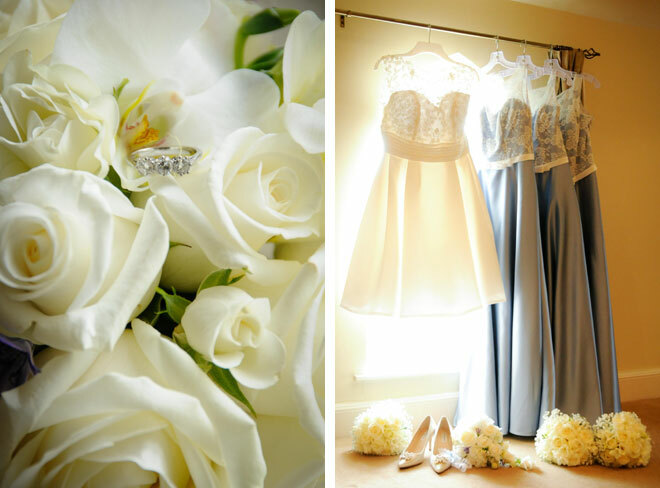 This was a perfect choice as it coordinates so well with the delicate lace on their dresses. 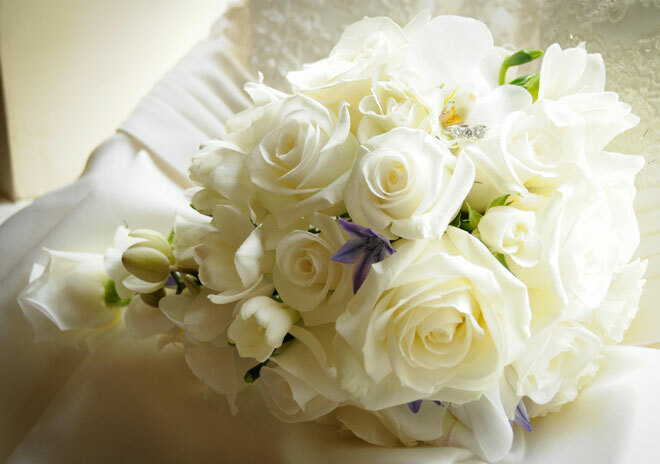 The posy bouquets were made with ivory roses and freesias to link with the bridal bouquet. I think the gypsophila collar gives the bouquet a halo effect and makes it look soft and very pretty. The bouquets were finished with coordinating satin ribbon to match the dresses. The bridesmaids also asked me to supply gypsophila for their hair. So I individually wired small sprigs for the hairdresser to work into their hair. This works so well as it doesn’t dominate the hairstyle, it simply adds a pretty touch. 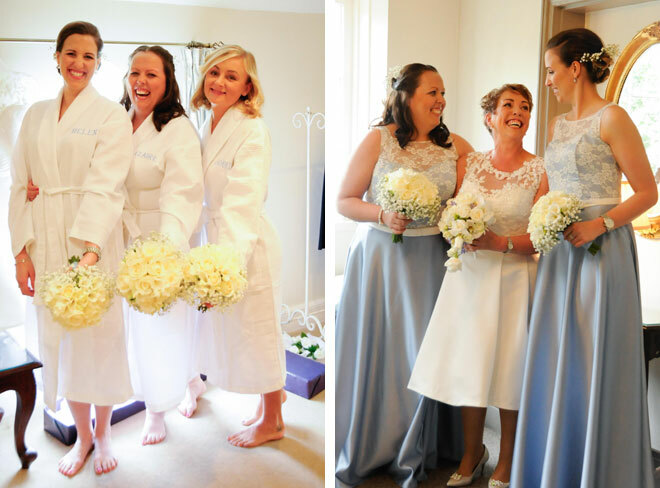 The wedding ceremony and reception were both held at the same venue – Warwick House with everyone getting ready there on the morning of the wedding. Having the ceremony and wedding breakfast in the same venue helps to aid the relaxed atmosphere as there is no hassle of moving between locations. 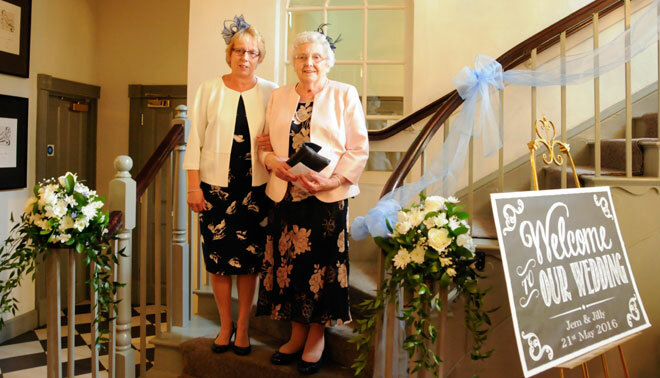 As it was all happening at the one venue Jill and Gem asked me to create flower decorations for the banisters at the bottom of the stairs. 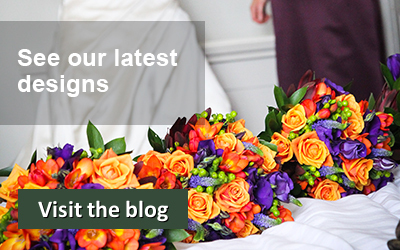 This is a great place to position flowers as all the guests see them when they arrive at the venue. It also gives a good backdrop if you need to take indoor photos if the weather is not as good as it was for this couple. I thoroughly enjoyed working on this wedding and I was absolutely delighted to be able to share these fabulous photos on my website.